Nether Kellet is set in rolling limestone pasture; to the east are extensive limestone quarries. From the higher parts of the village there is a view westwards over Morecambe Bay to the mountains of the Lake District. Inside the Church of St. Mark, on the north wall, there is a memorial to the men of the village who served in both World Wars. It is of dark oak, 31 inches by 14 inches, the inscription being written in black ink or paint. 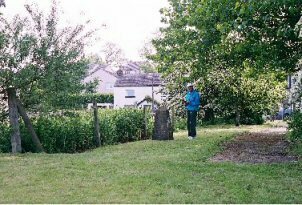 There is some discussion in the village that the Peace Stone should be moved to a more suitable location. With thanks to Ivor Holden for information about the church memorial. Ivor is the great-grandson of Sgt. Walter Jackson DCM, named there. 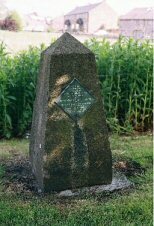 The citation for this award in the London Gazette says "He carried out many daring patrols. Under heavy shell and machine gun fire he has shown great coolness in sending back valuable information. During the whole time his unit has been in France he has trained the sniping and scouting section, and maintained a high level of efficiency". The question has been asked - Did the men from the Thankful Villages serve in quiet parts of the World away from the battlefronts, so avoiding casualties? It is answered here, and in other Thankful Villages such as Maplebeck and Catwick, with a definite "NO".